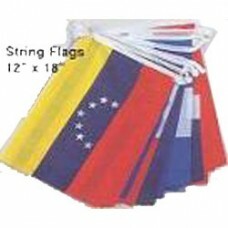 South American String Flag - 20 Islands. This is a string flag containing flags of 20 South American Islands each measuring 12 inches by 18 inches. There is approximately 6 to 8 inches in between each flag. Great for formal and informal events, businesses or when representing your region as a whole. The countries included are: ARGENTINA, BOLIVIA, BRAZIL, CHILE, COLOMBIA, COSTA RICA, CUBA, DOMINICAN REPUBLIC, ECUADOR, EL SALVADOR, GUATEMALA, HONDURAS, MEXICO, NICARAGUA, PANAMA, PARAGUAY, PERU, PUERTO RICO, URUGUAY, VENEZUELA.